Raptore is an Argentinean heavy metal band born in 2012. Two years later they released their first demo. Consisting of two songs, it was a precise attack packed with high energy and razor-sharp guitars, all lead by the high pitched vocals of Nico Cattoni (vocals/guitar). I've been following the band ever since. Time has come, Rage N' Fever has finally arrived! Raptore's full length debut is great as expected. When you look at the artwork you instantly know what kind of stuff you are getting: high octane metal filled with rabid riffs and catchy choruses. Heavy metal as it should be, simple as that. I mean, what else can you think of when you see a car on flames jumping off a cliff, leaving behind a trail of burning tires? Most songs are rooted in classic heavy metal with a fair share of catchy riffs and big hooks in the style of Scorpions/Accept. There are gang choruses thrown here and there, for example “Night on Fire’s” (that particular song was used as their first video clip). It isn’t hard to understand what kind of metal Raptore wants to practice. They wear their influences proudly on their sleeve while adding some of their own style in the process. The emphasis is put on the choruses and the vocal melodies, which are rooted also in classic 70s rock in the likes of Kiss and Bad Company. 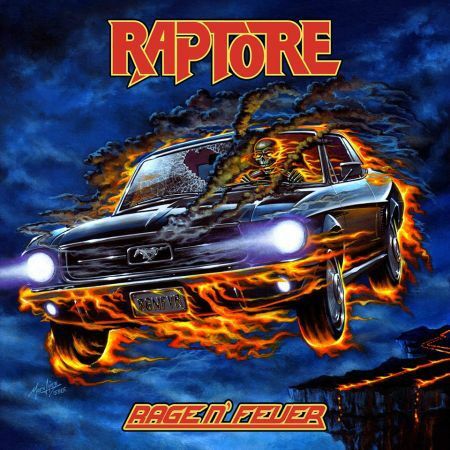 Raptore shines in the crushing mid tempo tracks “Time Has Come” and “Back in the Oven,” just like Accept, one of their biggest influences. The band feels comfortable and in total control when things slow down a bit. Wolf Hoffman’s school of riffing! There is also room for those who like it fast. “Evil Hand” (one of my favorite tracks on the entire album) is probably their thrashiest song, with a noticeable Anthrax and Testament influence on the vocal melodies and the main riff. “Runner of Death” is another fast one, maybe closer to classic speed metal bands such as Exciter. While these are the most aggressive moments, Raptore’s underlying rock n roll vibe is still present in the lead guitar work. That’s a positive thing to me, they sound like a rock band showing us their take on speed metal. Finally there’s also a power ballad that showcases Raptore’s most dramatic side. To me, “The Flame” is a total success. It sounds as genuine and passionate as the other tracks on the album. It follows a very usual structure full of crescendos and arpeggios, but with such a conviction that you just can’t help but singing that chorus with all your lungs. All in all, I think the band did a really fine job. I wish more bands in Argentina sounded like this. It may sound easy, but crafting sincere and energetic music is a tough task. I see a very promising future ahead, even more promising than their bright present. Get Rage n’ Fever at all cost! Zeitweise leicht angethrashter Heavy Metal, made in Argentina. Support Your Global Underground und so! In der letzten Zeit sehe ich auffällig viele Veröffentlichungen aller Metalspielarten aus Argentinien. Erlebt wohl gerade eine Hochphase. Könnte etwas mehr Thrash vertragen, aber ansonsten nicht übel.